East Brookfield -- James W. Parmenter, one of Brookfields best known and respected citizens, passed away on the evening of June 28, at the Barre City Hospital. 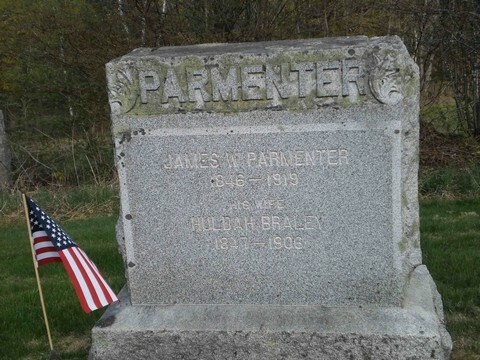 Mr. Parmenter was born in Warren, June 16, 1846, and while still a lad in his teens served as a volunteer in the Civil War. After his discharge he became our town blacksmith, and later on our store-keeper and postmaster. He was a member of the local Masonic Lodge, and G.A.R. Post, and the Second Congregational church of this town. He married Miss. Huldah Bealey of this place, who died in 1906. He is survived by two daughters, Mrs. G. K. Sprague and Mrs. L. W. Morse, both of Brookfield, six grandchildren, James, Doris, George jr., and John Sprague, and Theron and Louis Morse, one sister, Mrs. Savilla Green of Brookfield, and one brother, C. H. Parmenter of Henniker. N. H. . The funeral was held June 30, at the home of his daughter, Mrs. C. K. Sprague, with Rev. John Irons, of Williston officiating. Interment was made in Brookfield cemetery.